With all the progress made thus far at risk, a vote in this election may mean more than it ever has before. For the months leading up to this moment, the American people — as well as the world — got to see America in its rawest state: emotional and fed up. We saw the rise in populist and outspoken candidates like Bernie Sanders and Donald Trump. We saw the downfall of party sweethearts like Jeb Bush and Chris Christie. And we saw the increased divisiveness and dissatisfaction with both major party candidates — historic as they may be. All things that were conventional in prior elections are a thing of the past; 2016 marks a change in the American democracy. Hopefully for the better. Hopefully. Although I’ve been through laundry-cycles of feelings about this election, I have confidence in my fellow Americans that we will choose a president that will lead us forward. I have confidence that my generation will show up to the polls — a generation that is more diverse than its predecessors. 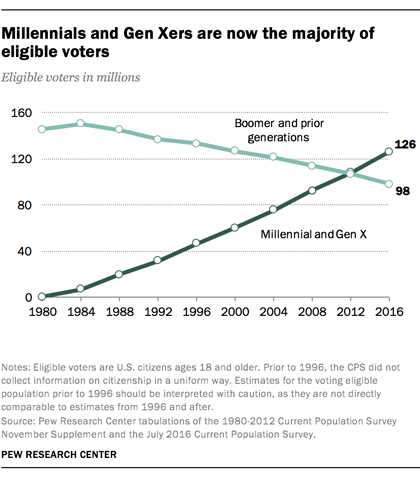 Combined with Gen Xers, we have the capability to steer the election; the youth vote cannot be overlooked. I was thrilled when my 19 year-old brother cast his ballot for the first time in Nevada (after much pestering to get him registered in the first place!) Although faith in the current political system may be waning (with the abhorrent and unfit rhetoric of one nominee, the reversal of a key section in the Voting Rights Act of 1965, political gridlock, etc. ), this election has been a catalyst for the reluctant to come out and vote. A lot hangs in the balance for the AAPI community, as well as for other minorities. The years of progress made for voting equality, freedom of religion, marriage equality, access to public resources and fair representation are at risk at all levels. Without representation that has your community and interests in mind, from the presidential ticket to the local government, it is difficult to affect change. A multitude of voices, backgrounds and experiences in government can only improve how it serves its multifaceted electorate. As someone who grew up Muslim, it was really difficult for me to listen to the anti-Muslim sentiment. I grew up in a conservative town during post-9/11 America; I thought I had endured the peak of it. The national security plan proposed by one nominee to ban all Muslims is uneducated, to say the least. It’s unlawful, unjust, and against the principles this country had been founded upon. My vote will be to uphold our civil rights and to fight fear and bigotry. Throughout my childhood, my mother heavily emphasized exercising the right to vote. Growing up in Indonesia’s 31-year era of military dictatorship, my mom truly values the right to vote in a free democracy. Under Suharto’s rule, the Indonesian electorate had little faith that their vote would count. The controlling political party was notorious for rigging, intimidation and voter coercion, and straight out lying about ballot counts. When you’ve experienced a imitation democracy, you do not take your right for granted once truly empowered with it. After my mom became a US citizen in 1996, she has always voted with gusto. She sends me a text of her cherished “I Voted” sticker each time she leaves the polling place. So who am I going out to vote for? I’m voting for those who fought for my right to vote: Susan B. Anthony, Sojourner Truth, Ida B. Wells. I’m voting for my mother who taught me to never take the right to vote for granted. I’m voting for my fellow Americans who in 2016 still have to jump through hoops to have their voice heard. I’m voting for my fellow women around the world who exercised their right to vote under the threat of death. I’m voting for a brighter future for myself and for my people.